Our range of products include Car Neck Rest. Car Neck Rest presented by us is developed using avant-garde technology and newest machines. These are used for providing comfort to the neck of the driver and are offered as furnishing products in the domestic market. Our neck rests are presented in an affordable and reliable manner and these are broadly admired to provide brilliant comfort to the clients. We offer these products at market leading prices to our respected clients. We are instrumental in providing advanced quality Car Neck Rest designed using finest quality raw material. 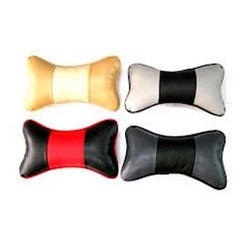 This Car Neck Rest is offered in array of shapes, designs, colors and sizes. They offer comfort during driving and also while sitting on non-driving seat. It makes the user feel stress-free and is easily available in the market at rock bottom prices. We are firm to provide exclusive range of Car Neck Rest. The raw material used in the production of this range is sourced from the trustworthy vendors of the industry and ensure the quality of the end range. Presented in a range of colors, designs and specifications to meet precise requirement of clients, our offered range is perfect for all types of car models. Eye-catching designs, enduring finish, lasting shine, extended durability are some of the quality. We have broad range of all types of Car Neck Rest which are designed using exceptional quality raw material and modern technology by our skillful professionals. In order to make sure quality, this neck rest is rigorously tested on different parameters by our experts. Apart from this, incredible quality and unique design augment the demand of our presented range in the market. By: Comfort Mattresses Mfg. Co.